With a number of great synopses out on the internet about Captain Abu Raed, as usual I want to focus less on that and more on some specific cultural elements embedded in the film. However, since you might not want to stop reading and get to the internet to read a synopsis, here’s a brief one for you. Abu Raed (meaning, the father of Raed) is an elderly janitor at Amman’s airport, but one day is mistaken by a neighborhood kid, Tareq, from their poor area to be an airline captain—Abu Raed had found a captain’s cap in the trash bin and worn it home. Tareq rounds up the other neighborhood kids and they pester Captain Abu Raed to tell them about his adventures as a pilot. After protesting that he wasn’t a pilot at all, Abu Raed succumbs one day and starts to tell them some adventures—really what he’s gleaned from reading books and being in the airport. Abu Raed becomes solicitous of the boys, especially when he one day discovers Tareq out of school selling biscuits on the street. He thinks he’s helping Tareq by buying all the biscuits himself, but instead Tareq’s father just gives him more to sell and eventually takes him out of school permanently in order to run a small kiosk. Over time another neighborhood boy, Murad, who eschews the story sessions, makes it his duty to ensure that the kids know Abu Raed is nothing but a janitor, which he does by stealing money from his abusive father and taking Tareq and others to the airport to see Abu Raed cleaning floors. The kids turn away from Abu Raed in disappointment. But Abu Raed does not turn against the kids. Instead, he actually gives Murad his captain’s hat and says, “It’s ok”. Instead of regaling the kids with stories and encouraging them to attend school, Abu Raed realizes he has meddled with Tareq’s life and caused more damage than good, but that he can meddle in Murad’s life for something worthwhile at least. In the last scene, Abu Raed solicits Nour’s help (Nour is a female pilot Abu Raed has grown close to throughout the film) to get Murad and his mother and brother out of the house, so he can confront the abusive father, who we are led to believe attacks Abu Raed with a club behind the closed doors of the home. The movie ends with Murad as an adult, standing with his captain’s uniform, gazing out at the planes at the Amman airport. It was interesting to note that while other films, such as The Secret of the Grain recently reviewed here, are lauded and noted for their slow development and lengthy detail in scenes, some similar development in this film are called “slow as molasses” by one internet reviewer (http://www.thestranger.com/seattle/captain-abu-raed-as-sweet-and-slow-as-molasses/Content?oid=1775869 )—not necessarily as a compliment to the unfolding of the film. Again, I, as in other analyses, call attention to the differences in story time between certain films from Africa and the Middle East or other non-Western cultures, and those from Western traditions; while the Western films most often elide time, focus mostly upon scenes of action or sensation or plot development, sometimes films from other traditions (including Native American films for instance) emphasize the quotidian, the hum-drum, the action-less moments that indeed fill lives and time. This film fits into a medium category, as there are indeed instances of ellipses and emphases on plot development, but they coexist with lengthy moments of non-character development but daily ritual of life, for example when over and over again we are shown Abu Raed getting off the bus and trudging up the stairs of the neighborhood into his home, or scenes of him regaling the kids with stories though we aren’t allowed to particularly hear them, or Nour traversing the airport after a flight, etcetera. These scenes don’t just teach us about Abu Raed or others, they teach us about time passing, about daily repetition in life, about life passing. And life passing is important, both for Nour who frets about being in her 30s and unmarried, for Abu Raed facing aging and loneliness without wife or son in his old age, for the kids whose future is being shaped day by day by their parents, Abu Raed, and society. One element that is touching in this film is that Abu Raed is alone except for his mates at the airport, but once he reaches home he has only his deceased wife to keep him company. He is a lonely old man, one reason that the kids can appeal to him to regale them with stories—they are the child he once had but who died at a tender age, as he reveals one afternoon to Nour. Abu Raed is not just a widower who loved his wife, which I hate to say but is a rarity in a Middle Eastern film—a man who loves his wife, that is—but a man burdened by losing the son that was a miracle in the first place. Abu Raed tells Nour that he and his wife were told they could never have children, until they discovered the wife pregnant, and were overjoyed. The untimely death of the son, then, is a double disaster. In the Middle East, one’s son carries on the family name, the bloodline. The son is expected to care for the parents in their old age. Abu Raed has no one. No family line, no one to care for him, no one that he can care for himself. That is, until he meets Nour and the children, who open new opportunities for him to experience life again. Telling stories to the children replaces telling stories to his own deceased son, participating in rearing the children or encouraging them to seek new options replaces what he might have done to his own child. The children then become surrogates in a sense. Abu Raed, wanting to be fatherly, thinks he can help Tareq, who’s taken out of school to sell biscuits, but when he goes to the family to intervene, he’s told by Tareq’s father: “You came to my house to tell me how to raise my own children? !” and of course Abu Raed’s answer is “No”. What he can do is buy the biscuits on his meager salary, but that backfires and Tareq eventually has to quit school, a real loss because he is very smart, to run the family kiosk. There’s no “social services” that can tell the father to keep his son in school if the father wants the son to work, although there are laws about mandatory school attendance; however, all throughout North Africa and the Middle East it is nigh impossible to actually enforce the laws. Child labor is a major issue, especially labor in fields that are damaging to the health of the children. Tareq is lucky that he only has to sell, rather than paint cars, collect garbage, work in a factory, or do other tasks to help support his family. The lack of social services is also evident when Abu Raed wants to help Murad’s family—the father is an abusive alcoholic who beats his sons and wife regularly for any reason often throughout the film. At one point, after Abu Raed has given Murad the captain’s cap, Murad goes into an airline agency to ask about whether one has to go to college to get a job there. He’s brushed off by the agent, but leaves having swiped a little toy airplane. As punishment, his father burns Murad’s hand in order to scar him, as he himself had been scarred as a youth caught stealing by his own father. Once he discovers the burn, Abu Raed goes to the police to report it, but the police only half-heartedly interrogate the father—even revealing that it was Abu Raed who reported him—so that the abusive father can continue his abuse without check, which he does. Finding the father drunk on the street one night, Abu Raed goes so far as to lift above his head a huge stone, but can’t bring himself to kill the man. Needing a solution, Abu Raed turns to Nour for suggestions, and we next see them arriving at Murad’s house packing up the wife and two sons into Nour’s car to take them away. The fact that there are no solutions, no options for battered women or children, in most of the MENA region, is highlighted. While many NGOs try to fill the void of government services to help in this regard, many times either women do not know about the services, or are too afraid they will be found and killed by their husband to take advantage of them. Abu Raed only succeeds in saving this one family because he has a rich friend, Nour, who can take them in and help them. We saw in Farida Benlyazid’s Door to the Sky that she opened a zawiya for abused women but often there is little option for abused women or children in Murad’s circumstances. In fact, Abu Raed ostensibly pays with his own life in order for the family to escape, though it is not exactly made clear what he hopes to achieve by sacrificing himself. That the father should repent? Instead, he takes to Abu Raed with a club and shouting in rage. Of course it might not be very cinematic to have the family resort to an NGO, especially as the problem of abuse is pretty rampant. Another interesting element of the film is Nour’s unwillingness to marry the bozos her father drags forward, yet she worries about being in her mid-30s and unmarried. She would like to marry, she tells Abu Raed, but in her own time and way. His response to her is to not cave in to social mores but to be free. Easily said to a woman who has the wherewithal to be a pilot, a rich woman with a luxurious lifestyle and freedom to travel. The film does well to show a successful woman in Jordan, but it rather glosses over the real pressures that woman have to marry or be considered spinsters and unmarriagable. Or the fact that often women have to struggle with their parents over who they can and when they will marry. Child marriages, arranged marriages, father-decided marriages still occur in which the female has little say in who the groom will be or when the marriage will occur. This wouldn’t happen to Nour because she is wealthy and her father a pushover, but for someone less wealthy and lucky, what happens if they don’t marry or don’t want to marry who is chosen for them? What are the real options for women? Can un-wealthy women in Jordan be pilots and determine their own fate? In fact, we get the view from Murad that even poor boys such as he have little faith that he could become a pilot because poverty closes many doors. That he is a pilot at the end of the film—because he’s taken in by Nour ostensibly—would not have happened for him if he’d been left alone by Abu Raed? Many commentators about the film make much of Abu Raed’s ability to speak a few words of English and French, and that he reads books, which I almost find insulting, as though a Middle Eastern man/woman would not read or speak other languages? How ethnocentric. Many people in the Middle East or North Africa speak several languages out of necessity—their local dialect, the Arabic of news and books, and foreign languages—especially if they work in tourism and especially if they have an interest in the world, as Abu Raed does. And of course Nour would speak English as an upper class and educated woman who travels the globe. The film does well to reiterate the class differences we find in the Middle East—not all inhabitants are poor nor rich, just as they aren’t terrorists or fundamentalists in their religion. In fact one area the film totally eschews is religion! The film could almost be set anywhere as there is no obligatory scene of prayer to indicate that this is a Muslim society. We know it is Jordan through scenery and dialogue. The final element I would like to discuss concerns an elided element of the film, at least for foreign viewers, which is the Palestinian refugee issue in Jordan, the setting of the film. This is especially significant as many reviewers highlight how Matalqa used children, orphans actually, from Palestinian refugee camps, as his actors. While it is not obligatory to mention the Palestinians, or perhaps there is dialogue in dialect that reveals one or the other character to be Palestinian but we foreign viewers won’t catch that, it is interesting that this large component of the population and the origin of the child actors is elided. Just wonder why. 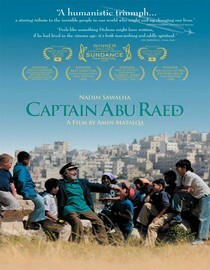 All in all, the film Captain Abu Raed is quite endearing, from the lovely acting of the children who speak with their eyes as much as their tongues, to the performance of Abu Raed (Nadim Sawalha) who slowly grows in our hearts as a gentle and caring man (too rare these days in films? ), to the unexpected sacrifice at the end of the film to save Murad’s family. Bravo, Amin Matalqa, and hopefully we’ll see more of Jordan in films in the future, what with the newly opened Red Sea Institute of Cinematic Arts in Aqaba! This entry was posted in netflix films and tagged amin matalqa, arabic, captain abu raed, cinema, cinema and culture, film, international cinema, international movies, jordan, jordanian cinema, middle east, movies. Bookmark the permalink. You are so awesome! I do not suppose I’ve truly read through something like this before.